Outsell announced today a major upgrade of its solution at the NADA 2018 conference, taking place Mar. 22-26, 2018 in Las Vegas. 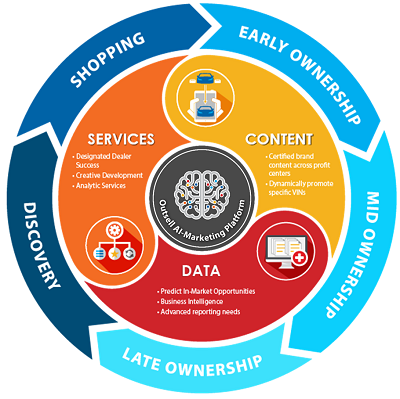 Outsell’s newest platform – Outsell 5.0 – has been enhanced with even more artificial intelligence capabilities, providing automotive dealers with unprecedented insight into buying behavior and the ability to take targeted content to the next level, with automated, multi-channel campaigns that are individualized to each person’s exact preferences. In addition, Outsell is expanding its Equity Mining capabilities with 5.0. Outsell utilizes a machine-learning formula to provide equity value estimations, and display them on consumer and prospect profile pages, which enables sales staff to identify and reach out to consumers with positive equity. A new dashboard that highlights for dealers in-market shoppers, current campaign performance, and ROI of individual campaigns in terms of linked sales/service – making it easy for dealers to quantify the revenue impact of each campaign. Customized campaign and targeting recommendations that dealers can choose to send with one click. The unique ability to easily create AI-driven micro campaigns for a select, targeted audience. Powerful new filters such as ‘move a model’ and ‘need to find a trade in’ that help dealers meet their goals. Outsell provides a list of people the dealership can contact who will likely convert on specific models or a list of people who own a specific vehicle and are likely ready to trade up. Outsell will demo Outsell 5.0 publicly for the first time at NADA 2018. Stop by booth # 2196C for a demo, or make an appointment by visiting outsell.com/nada2018. See a video highlighting Outsell 5.0 here.